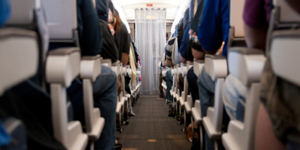 Q: Can crossing your legs during a flight cause DVT? A: No, leg crossing is no more dangerous than watching the in-flight movie. Ever since 'economy class syndrome' hit the headlines in the '80s and '90s, we've been looking for ways to avoid deep vein thrombosis (DVT) and its complications. On long-haul flights, many of us are terrified of relaxing into our seats and enjoying the in-flight movie for fear a blood clot will form in our legs, travel to our lungs and kill us. We do aerobics in the aisles to keep our blood moving, haul on compression stockings to shoot blood back up to our hearts and pop aspirin to reduce the chance of a clot. Airlines have joined in, offering us detailed health advice via their in-flight magazines, videos, and websites, on how to avoid a clot. We've been told not to cross our legs during a flight. The idea is that leg crossing constricts blood flow around the knee area, making a clot more likely. So can crossing your legs really bring on DVT? Alex Gallus, professor of haematology at Flinders University Medical School in Adelaide, is emphatic in his answer. "Oh, forget it," he says. "It defies anatomy." The popliteal vein runs down the back of the knee, right down the middle. "If you cross your legs, you have the outside of one knee resting on the outside of the other," says Gallus. "You're not actually constricting anything." He also says that he hasn't seen anything in the literature to suggest a strong link between leg crossing and DVT. Nevertheless, the myth persists. And he says his patients often ask whether it's safe to cross their legs on a long flight. So, what advice does he give them? "If you're comfortable crossing your legs, shift from one to the other every now and again," he says. So, if avoiding crossing your legs is a myth, how does all the other health advice on avoiding DVT stack up? You may be surprised how little is based on direct evidence. One of the first things we're told is to avoid sitting still for long periods. That's because the blood in your calves isn't returned so efficiently back up to the heart. "Normally, your muscles would compress the veins and return it. But if that muscle pump is left idle, if you just sit there, blood could sit in the calf for half-an-hour, an hour," says Gallus, making it more likely to clot. "There's evidence that if you move around, you improve blood flow," he says. "Whether it's sufficient to prevent clot formation, I don't know. But moving around's harmless." Another piece of advice is to wear loose clothing, presumably to avoid restricting blood flow. "There could be something in it," he says. "It isn't impossible. But we're guessing." Surely, keeping up the fluids is based on sound evidence? Wrong again. "It's a common sense recommendation rather than evidence based," says Gallus. "In theory, the contracted blood volume could lead to stasis [sluggish blood flow] but you'd have to be pretty dehydrated." But it can't harm to drink plenty of water, can it? "If I was being mischievous, I would say that if you keep drinking, you keep running to the loo, so you keep active and that's a good thing," he says. In guidelines on DVT prevention released earlier this year, the American College of Chest Physicians (ACCP) agrees there's "no definitive evidence" that dehydration is linked with an increased risk of DVT. Then there's advice about limiting your alcohol intake. Although the ACCP says there's "no definitive evidence" linking alcohol intake to clots, Gallus thinks it's not a good idea to overdo the alcohol, largely because of its sedative effect. "You don't want people lying there like a log," he says. How about where you sit on the plane? Do you automatically up your risk depending on which ticket you buy? Yes and no. First the 'yes'. Studies have shown that you're more likely to develop DVT if you sit in a window rather than the aisle seat. "You curl up in a corner, get embarrassed about climbing over the person next to you and have a stiff scotch and a sleeping pill," says Gallus about a sequence of events that might lead to inactivity. "That's where I suspect the problem lies." Now, the 'no'. The idea that you're more prone to DVT if you sit in the cramped seats of economy class rather than in the more luxurious business or first class has long been discredited, he says. Compression stockings are on sale at airport pharmacies and some people swear that they help reduce swelling. But do they reduce your chance of DVT? "Compression stockings must be properly fitted to be effective, can't prevent all clots, and can have side-effects," says Gallus. For instance, they can increase superficial phlebitis (inflammation of the surface veins), lead to blistering and local skin allergies. Also people with diabetes or peripheral vascular disease shouldn't wear them. Then there's the question of taking aspirin to thin the blood and hopefully reduce your chance of a clot. "Aspirin may or may not have a protective effect in this situation," says Gallus, "But if it does, it would probably be small." Aspirin also has well known gastrointestinal side-effects. So with this mixed bag of evidence, what can you do to reduce your chance of a blood clot forming then travelling to your lungs? Remember that the risk for the average middle-aged traveller is already low – about one in 40,000 long-haul flights, with a death about once in 2 million flights – according to Australian government figures. Gallus recommends sticking to what he calls the "common sense advice". "Do your leg exercises, stretch every so often, don't knock yourself out with a combination of alcohol and a sleeping pill. Stay active." Alex Gallus, professor of haematology at Flinders University Medical School in Adelaide, spoke to Anna Evangeli.